Duke and Virginia square off again this Saturday, and the matchup is bigger than ever. Arguably the ACC regular season championship game, with Virginia’s lone loss coming at the hands of the Blue Devils. I broke down 3 main things for both Duke and Virginia with sets and schemes they had in the last matchup. The biggest questions are what Duke will do defensively and how Virginia will counter it, with the focus on Tre Jones impact when he returns on the defensive side of the ball. 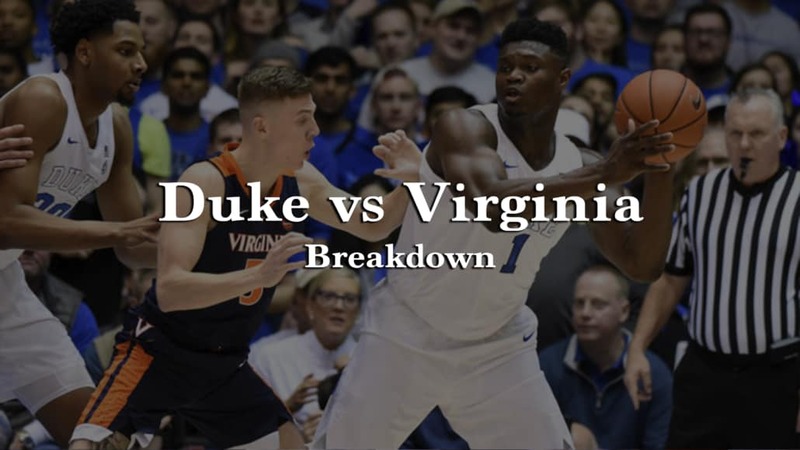 I did a breakdown podcast with Jordan Sperber that went deep into the X’s & O’s and decisions that can be made and tweaked for the rematch which you can find here: Duke vs Virginia Preview Podcast. Duke switched a lot in the matchup vs Virginia, primarily looking to take them out of their Mover Blocker actions that is the primary offense Virginia runs. I have not found any examples from earlier this season where a team switched as much as Duke did, even going 1-5 switching every single action that Virginia ran. When Duke switched it really forced Virginia to play in Isolation and create 1 on 1, which is not a strength and what makes Virginia an elite offense. Going to a 2-3 zone is something that Duke has done periodically this year, but they ran it as a primary defense last year. Coach K learned the ins and outs from Boeheim during their time coaching the USA national team, so it is always something Duke can fall back on when things are static or struggling to guard a team. Duke has SO much length and athleticism I think its something that they will run randomly throughout the game to use a change of pace and keep Virginia guessing. Coach K does not run a complex offense at Duke, unlike past years when he ran a deep motion offense, this year they run basic 4-Out and let their players make plays. Duke primarily runs Horns sets when they do run plays, and one of them is getting Zion at the elbow and letting him work in Isolation. This play is difficult to handle because it is almost in the middle of the floor so even if you influence one way or the other it opens up driving lanes. Virginia went away from their normal Mover Blocker offense to run their “European Ballscreen Motion” more since Duke was switching everything. When they ran this ballscreen motion, they were able to cause some problems and attacked Duke’s switching easier. The reason this works so well to attack the switch is because the floor is spaced and basically 5 out at times, so the paint is open for slips. Tony Bennett has really good X’s & O’s, although many people do not like them because they are deliberate and play at a slow pace. One of the things you will notice is after a timeout or end of games he has good quick hitting actions ranging from Hammer/Throwback plays as well as Elevator plays. Here is a good elevator play run for Kyle Guy at the end of the game when Virginia needed a score. This game is exciting, especially with the rematch at Virginia and there are layers that involve coaching on both sides of the ball. Stopping a forceful team like Duke is a tall task and Virginia is an elite defense, as well as how they will attack Duke’s switching defense. Ultimately I feel like Virignia will play well and come out strong, but Zion and RJ are too much for them in the end.